The price of iron ore has regained its footing following an 8% drop to $105 a tonne two weeks ago that had producers and traders fearing a free-fall in the steelmaking commodity. According to data from the The Steel Index, the import price of 62% iron ore fines at China's Tianjin port on Wednesday gained slightly to $111.90 per tonne. Iron ore is down some 15% since the start of the year as China's economy and particularly its steel industry enters a period of slowing growth. The closely-followed commodities outlook of the Bureau of Resources and Energy Economics, the Australian government's official forecaster, has now joined the chorus of forecasters calling the price of iron ore lower. 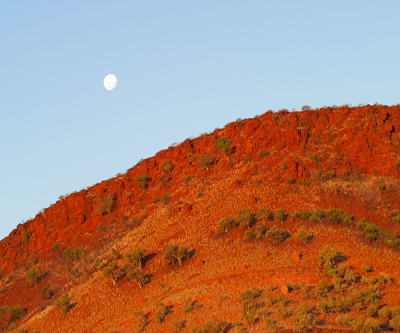 In its latest quarterly overview BREE forecasts that in 2014, the average contract price for FOB Australia iron ore is set to decline to $110 a tonne, down 7.5% from its previous forecast of $119. "Iron ore prices are not expected to recover to the high levels seen in 2013 due to the increased availability of supplies from new mines starting up in Australia in 2014," according to the report. The Australia FOB iron ore price averaged $126 a tonne last year. BHP Billiton, Fortescue Metals Group and Rio Tinto are targeting an additional 170 million tonnes in 2014. 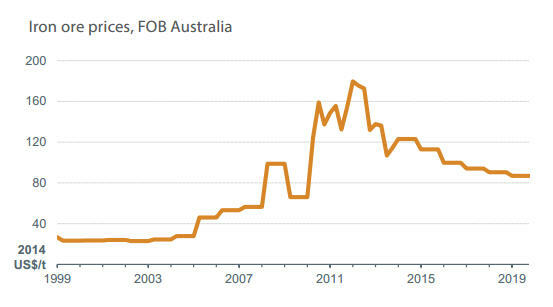 The Australian FOB price usually trades around $10–$15 below the Chinese import price, so the BREE forecast is not particularly bearish, but there is no return to the heady days of 2011 any time soon. $103 a tonne is seen for 2015 and it's a steady decline to $87 a tonne by the end of the decade.